Ongoing military operations in Rakhine State have resulted in more than 688,000 Rohingya refugees fleeing to Bangladesh since late August 2017. “We are concerned that if the response to this crisis does not increase to meet the huge demand for shelter, clean water, medical care and food, then the risk of disease outbreaks looms, and with that, a public health emergency,” said MSF Emergency Coordinator, Robert Onus. Those arriving in Bangladesh have shared stories with Médecins Sans Frontières/Doctors Without Borders (MSF) about their villages being systematically raided and burnt by the Myanmar military. Mob groups are targeting the Rohingya and women and children are being raped and killed. It is one of the largest displacements of people in recent memory, in such a short period of time. Recent surveys conducted by MSF in refugee settlements in Bangladesh estimate that at least 9,000 Rohingya died in Myanmar's Rakhine State between 25 August and 24 September 2017. As 71.7 percent of the reported deaths were caused by violence, at least 6,700 Rohingya, in the most conservative estimations, are estimated to have been killed, including at least 730 children below the age of five. Myanmar, also known as Burma, has high HIV and Tuberculosis rates, and MSF is the largest provider of HIV/AIDS care in Myanmar. MSF has been working in Myanmar since 1992. Results from six surveys MSF conducted in refugee settlements in Bangladesh revealed a grossly disproportionate response by the Myanmar military to attacks on police posts in August. At a conservative estimate, at least 6,700 Rohingya are believed to have been killed in Myanmar in a one-month period, including at least 730 children below the age of five. More than 660,000 people – mostly Rohingya – had fled to Bangladesh by the end of the year. When villages were burned to the ground, three of the four clinics run by MSF were destroyed. MSF operations in northern Rakhine were restricted between early August and the end of the year due to a ban on international staff and a lack of authorisation to carry out medical activities. MSF continued to reach out to the authorities to offer support in emergency and non-emergency healthcare for the people remaining in Rakhine. 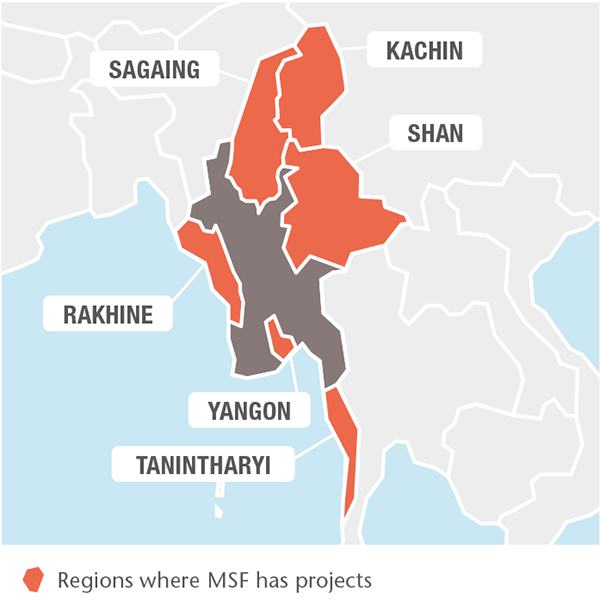 In September, MSF publicly called on the government of Myanmar to grant independent and unfettered access to international humanitarian organisations. Until August, MSF provided primary and reproductive healthcare in fixed and mobile clinics in Maungdaw district and supported Ministry of Health and Sports hospitals in Maungdaw and Buthidaung with HIV care. MSF teams carried out over 36,000 medical consultations and 1,043 referrals. In and around Sittwe and Pauktaw, MSF offered primary and reproductive healthcare, and emergency referrals through mobile clinics deployed to villages and five camps for internally displaced people, with an average of 1,820 consultations per month in the camps. MSF staff providing treatment to a girl with HIV in a clinic in Myitkyina, Kachin state. By the end of the year, MSF was still waiting for permission to operate as Rohingya continued to flee across the border into Bangladesh. Very few humanitarian organisations were allowed access to Rakhine. There was renewed conflict in Kachin and Shan states, where an estimated 100,000 people are displaced. MSF assists vulnerable communities there. In 2017, teams treated 16,586 people living with HIV and 504 patients with Tuberculosis (TB), including 28 with multidrug-resistant TB (MDR-TB), across the two states. 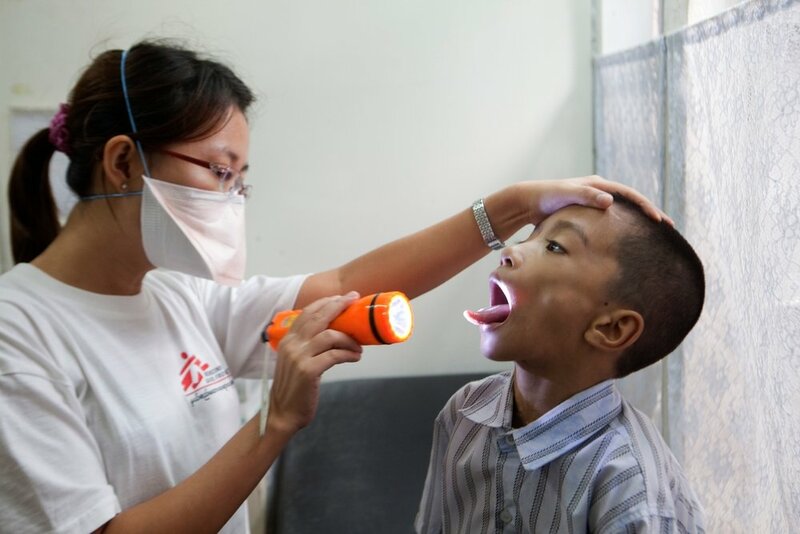 In Yangon, MSF provided care to patients with HIV and TB at two clinics. The team started treatment for 21 patients with extensively drug-resistant TB. In addition, 42 HIV-positive patients received treatment for MDR-TB and 194 for hepatitis C.
MSF continues to run a clinic in Dawei, supporting hospitals to decentralise HIV care. MSF is responsible for viral load testing for all HIV patients in Tanintharyi region, and works with the community to improve early HIV detection and treatment. Treatment for TB and hepatitis C is also available. A boy with HIV is examined at Dawei clinic. Due to a worsening political situation and the inability to secure access for MSF international staff, medical activities in Wa Special Region 2, northern Shan state, ended in mid-2017. Before closing, MSF conducted over 2,430 outpatient consultations through fixed and mobile clinics. A new programme focusing on primary healthcare and health promotion was launched in Naga, one of the most remote corners of the country, in Sagaing region.